Polyvinylidene fluoride (PVDF) piezoelectric nanofibers were fabricated through near-field electrospinning (NFES) to develop a flexible piezoelectric element. Innovative screen printing technology was employed to produce bend-type electrodes designed with d33 mode patterns. The electrodes and PVDF nanofibers were then attached to a polyimide film substrate. Compared with piezoelectric ceramics, piezoelectric fibers are inexpensive, flexible, and highly biocompatible. They also have a higher electron density than piezoelectric films, indicating that they are more efficient in electromechanical conversion. Thus, in this study, we adopted piezoelectric fibers to create a displacement sensor with bend-type electrodes that employed optimized pattern designs to increase the efficiency of piezoelectric conversion and sensitivity. The experimental results revealed that the type of electrode was critical for enhancing output voltage. 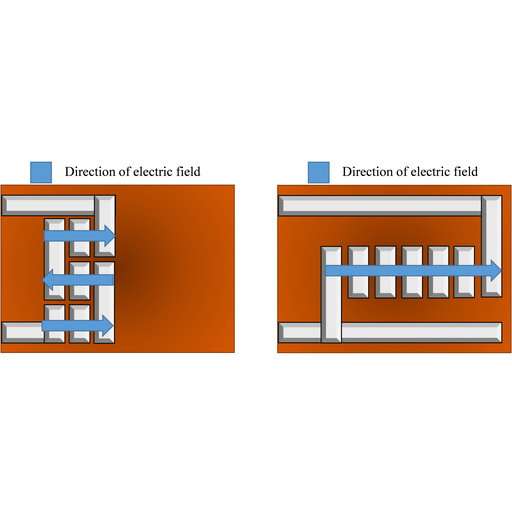 The novel bend-type electrodes induced an average positive voltage of 960.5 mV during a tapping experiment, increasing the maximum voltage by 59.74% compared with a series-type electrode. The positioning accuracy of the displacement sensor was 600 μm; thus, the sensor could successfully determine positioning, confirming the feasibility of the displacement sensing mechanism. Yi-Chen Chen, Chih-Kun Cheng, and Sheng-Chih Shen, Design and Fabrication of a Displacement Sensor Using Screen Printing Technology and Piezoelectric Nanofibers in d33 Mode, Sens. Mater., Vol. 31, No. 2, 2019, p. 233-244.